It’s National Sangria Day, in these United States. 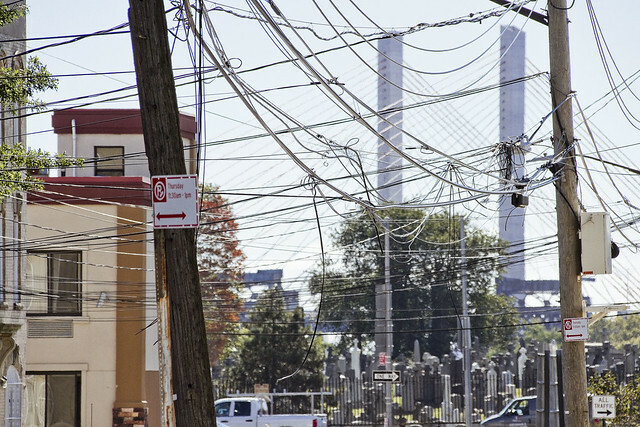 File this one under “Old Man shakes fist at passing cloud.” We really have to do something about these utility wires here in Western Queens. You’re looking at an amalgamated twenty five to thirty years of wire in the shots today. 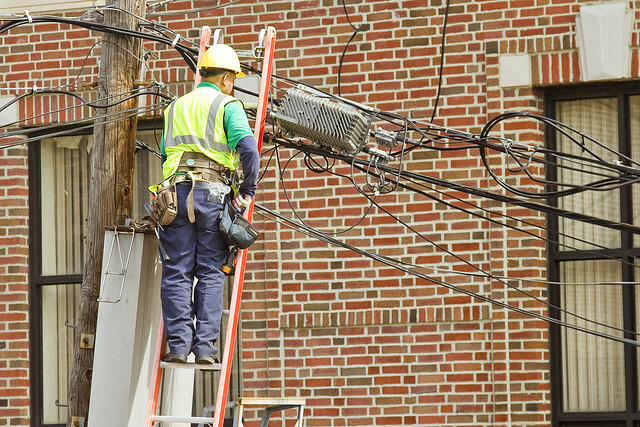 Somebody moves in to an apartment, they order cable or internet service, and next thing you know – there’s a new lead coming off of the utility pole that gets tacked loosely onto their wall. Thing is, the cable people never seem to remove the old wire, and just leave it in place. 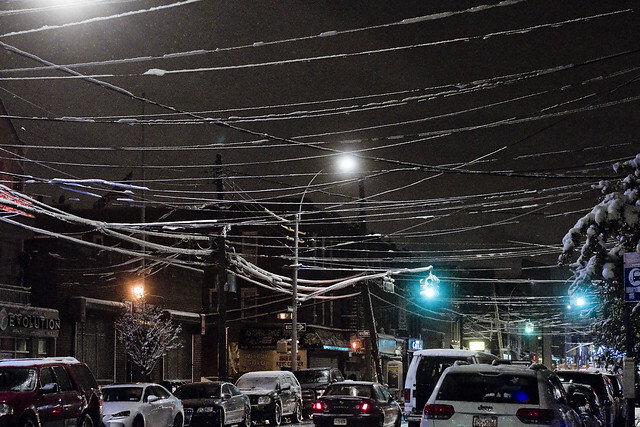 It’s when it snows that you can really discern the clot of coaxial cabling which owns the sky here in Astoria. The scene hereabouts is reminiscent of those old photos of Manhattan, the ones from the late 19th century when the telegraph and telephones had just come to town. There has to be close to a ton of cable criss crossing back and forth on every single block in Western Queens. When I say Western Queens, I really mean the totality of it, incidentally. 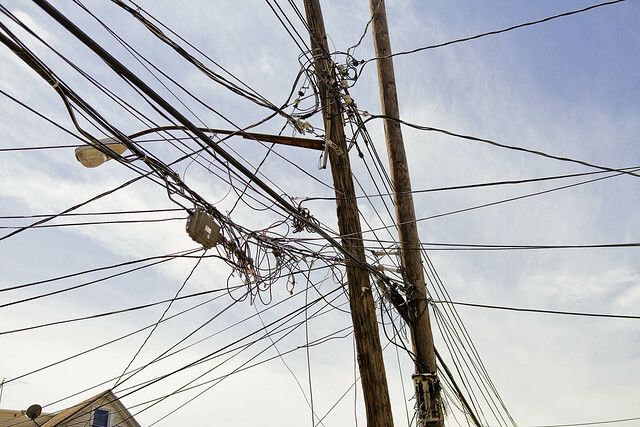 I see this mess everywhere that the local community board didn’t force the cable people to put their wires underground, as they are in Sunnyside Gardens and other parts of Community Board 2. It’s not just the cable folks either, Verizon and Con Ed can boast rather impressive bundles of electronic spaghetti mingling with the street trees. 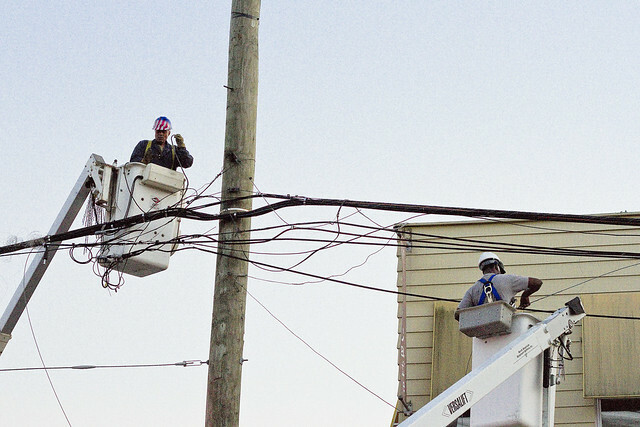 I’ve witnessed a couple of disasters, and a few near disasters associated with this utility wire situation. 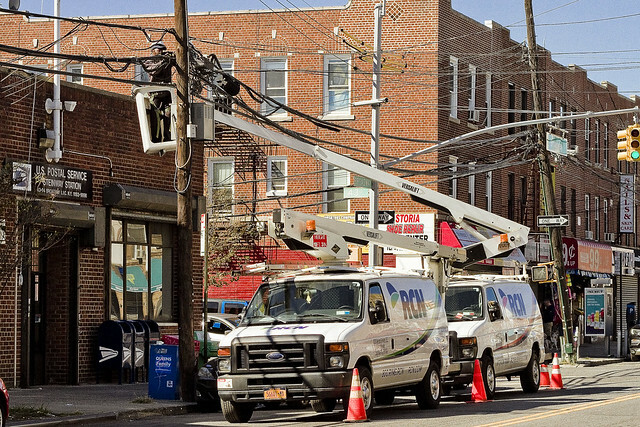 Thanks to the intervention of Councilmember Jimmy Van Bramer, the NYS Utility Commission compelled Cond Ed to replace a bowing utility pole on Astoria’s Broadway last year. Saying that, neither RCN nor Spectrum have bothered to move their wire hookups to the new pole yet, and their conductive tonnages are still being supported by the ancient wooden one. Additionally, as a note, the Spectrum Installers Union strike is still going on. Nothing will be done, and everything will get worse. Storm clouds will gather, rain will fall, and the puppies will be unhappy all about the neighborhood. The cables will fall and randomly kill us all, falling like asps from the sky. Ruination and death will be answered by calls for a rezoning by City Planning, with increased height and residential density in mind. That’s when the wires will disappear into the ground. All is ruination and death. Everywhere you look. The lines are exposed – but it makes them easier to repair. Aren’t you concerned about all those precious, precious union jobs that might disappear if these hazards didn’t exist to necessitate their maintenance thereof? 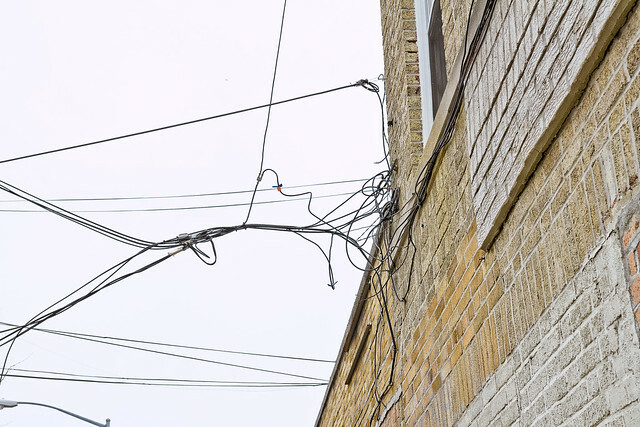 A fallen live wire is easier to handle when spotted and called in above ground than something that invisibly goes haywire below it. Tokyo seems to be doing fine, although I heard they’re trying to bury a ton of them ahead of the Olympics. Things are made safe when it becomes profitable to do so, and not before. What did I say? Don’t ask for something you don’t really want Mitch…at the very least, it’s my property taxes and YOUR RENT that’ll pay for the “improvement”.